Money and ticket counters give casinos an avenue for expansion. Cost-cutting measures are often necessary, especially when a gambling hall is looking to tighten the company belt in tough economic times. However, these processes are also useful when undergoing expansion or renovation. In this way, resources that are otherwise held down by running the business can be re-allocated for the project, which can help get it done on time or faster. Cutting the cost of labor by reducing the number of cage workers needed at the cash desk at any given time is always useful, and TITO ticket readers can help by speeding up the process of transferring winnings to customers. In Upstate New York, competition for casinos is strong, especially along the Niagara Falls area. Many existing institutions, such as the Saratoga Casino and Raceway in Saratoga Springs, adjusted in different ways. The Saratoga has sought to expand its resort operations overall. Recently, the "racino" announced that it was building a new hotel overlooking the hall for $34 million. It awarded the building contract to Kirchoff-Consigli Construction Management and Tishman Construction, and it will consist of 108 rooms, a restaurant, indoor swimming pool and meeting rooms for business professionals, totaling 123,000 square feet, according to the Times Union newspaper in Albany. The new construction comes at a time when the Saratoga is facing imminent competition nearby. The New York State Gaming Commission awarded three licenses for full-scale casino gambling - which includes card, dice games, slot machines and more games - in the state. One of the locations was in nearby Schenectady, along the Mohawk River. While there were some who suggested that the hotel, which has been in the planning stages until now, would not move forward as a result of the new license, the racino pressed forward and got approval from the commission after environmental concerns were addressed. With that said, the Saratoga acknowledges that a new opening would result in a loss of up 40 percent of its business and 250 of its 630 employees. The hotel opening is meant to mitigate the loss. Another way to minimize the effect of lost revenue is through TITO ticket readers and money counters. With fewer employees on hand, the need for fast processing of winnings still remains paramount. 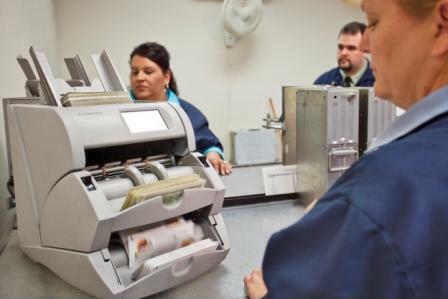 Money and ticket counters soften the blow by automating the process, keeping business steady and customers satisfied.